We could have been perfectly happy from a materialistic point of view if we had not had “West TV”. We were lucky (or unlucky) to live close enough to West Berlin which broadcasted the two public West German TV stations ARD and ZDF. Both were our window to the other world. On TV, we saw how life was in the West. Watching TV made the contrast between East and West very apparent and inflamed a strong material desire. Even though, we had similar products, there were some very distinct differences between the goods available in the West and the goods available in the East. The first difference was pricing. In the planned market economy, the federal government defined retail prices. Here are a few examples of how the federal government set the prices in East Germany. The prices are in East German Mark (M). 1 EUR = ~2 DM = ~10 M.
You will notice that prices for basic need products such as food, transportation, energy, and shelter were extremely low. That is because the government heavily subsidized these products. Prices for consumer products such as TVs, washing machines, and cars were disproportionately high. However, with a monthly income between 500 and 1,000 M, not out of reach. The second difference was availability of consumer products. In order to buy a car, for example, one either had to wait very long or had to rely on “connections”. Because of production shortages for cars, it took up to 15 year from order to delivery. In the black market, used cars often sold for more than the retail price. One closing remark regarding availability. Contrary to common belief, we really had enough to eat in the East. Food supply was not an issue. The third difference was product innovation. Like price, product development was driven by the federal government and not by consumer needs or demand. Cars provide a very striking example for the lack of innovation in the East. I am sure our engineers would have had the ability to innovate, but the socialist system limited their freedoms. 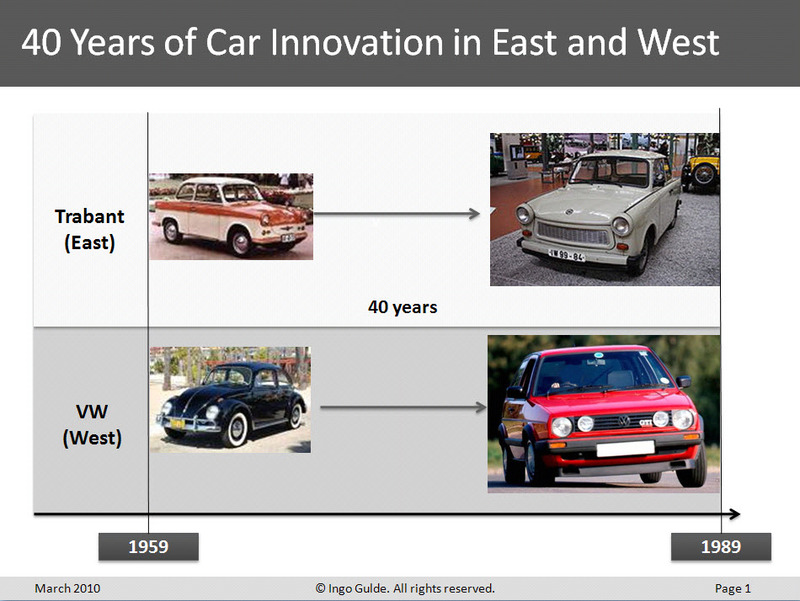 The following chart illustrates the difference of 40 years of car development between the East and the West. Notice how little the Trabant changed in 40 years. Compare this to the innovation leap at VW from the VW Beetle to the VW Golf. Differences in pricing models, product availability, product innovation, and product variety led to a strong material desire for West products. Expressing and fulfilling this desire was one of the drivers for the Change that happened in 1989.